Johnny Warman’s Magic Bus will play all The Who’s greatest hits in the Total Who show at The Apex on 22 July. The two-hour show includes songs such as ‘Won't Get Fooled Again’, ‘My Generation’, ‘Pinball Wizard’, ‘Who Are You’, ‘Substitute’, ‘Squeeze Box’, ‘I Can See For Miles’ and ‘Love Reign O'er Me’. Front-man Johnny Warman is no stranger to the hit parade himself; he was signed to Ringo Starr's record label, and had a string of hits in the 1970s and 1980s, including Screaming Jets, which featured Peter Gabriel. Johnny's love of The Who inspired him to form a band of top session musicians, who between them have worked with acts such as Elton John, David Bowie, Ringo Starr, Peter Gabriel, Asia, Julian Lennon, ABC, Cheap Trick, Bruce Springsteen and Foo Fighters. "It's an amazing show," said Johnny, "we perform all the classics and tell some fun stories about how the songs came about. It's full on. We pack in as much as we can. We make sure people get their money's worth." For Johnny, it's all about paying tribute, not mimicking the originals: "We're not big headed and don't get carried away thinking this was our music. And we don't dress up as The Who, smash up the stage, or swing microphones around. It's all about doing justice to songs that changed the face of popular music." "I'm still writing my own music but love to perform the Total Who Show," concludes Johnny. "They're all great songs, but I think 'Won't Get Fooled Again' is my favourite." The Total Who Show is at The Apex on Friday 22 July at 7.30pm. 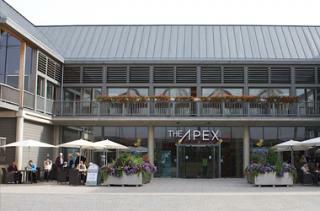 Tickets are £16, call the Box Office on 01284 758000, or visit www.theapex.co.uk for more information, or to book your tickets. Escape Hairdressing s a popular and well-loved salon situated on St John's Street. Hair is an independent boutique salon located in the central 'village' quarter of the town.